This site provides career-related information for each undergraduate major at KU, including common career paths, employers, and job titles as well as targeted job search links and resources. To locate a specific major, use the navigation toolbar on the left and select the appropriate School or College in which that program is housed. Additional resources available include, the Featured Resources section with links to several online sources of career and industry information, a self-guided majors research worksheet (pdf), and a comprehensive list of KU Majors (pdf). The College of Liberal Arts and Sciences (CLAS) student body is the largest population served by the University Career Center. Many resources are available to help you understand the value of and learn about career options associated with degrees from the College of Liberal Arts & Sciences. The UCC offers career coaching and assessment services to help students explore their unique interests, personalities, values, skills, and strengths. These services can help students better understand who they are, what they need, what they want, and how these things may influence their major and career choices. Students considering or pursuing CLAS majors often wonder "What can I do with a liberal arts and sciences degree?" The answer: just about anything! One of the greatest advantages a liberal arts and sciences background can provide is a wide range of career possibilities. CLAS graduates develop broadly transferable skill sets that employers in a variety of fields look for in potential hires. CLAS students should begin exploring their career options as soon as possible so they can begin gaining experience, both inside and outside the classroom, to help them clarify their career objectives. CLAS students should not limit their hard work to the classroom; employers are looking to hire candidates who have developed and demonstrated their talents in the workplace, on campus, and in the community. Getting involved in campus organizations, volunteering, studying abroad, working part-time, and completing at least one internship before graduation are excellent ways for CLAS students to gain a competitive edge in the job market. The UCC can help CLAS students connect with these opportunities! One of the most common concerns CLAS students bring to us at the UCC is that employers wont want to hire graduates with liberal arts degrees. Truthfully, many employers will gladly consider a candidate with a CLAS degree if the applicant communicates the value of their education clearly in their resume, cover letter, and interview. 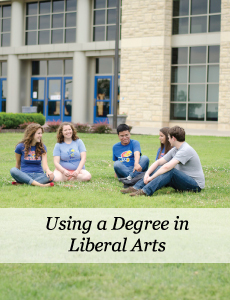 CLAS students should think about how their liberal arts background relates to their job target and develop ways to communicate this connection in their application materials and interactions with potential employers. Students struggling with this aspect of their job search process can meet with a UCC career coach for assistance. The UCC offers for-credit courses that can help CLAS students with their career exploration and job search processes. For example, freshmen and sophomore students might take EPSY 210, a career and life planning course that helps each student jumpstart their career development. As graduation nears, juniors and seniors should consider taking LAS 470, a job search strategies course designed specifically for CLAS students.